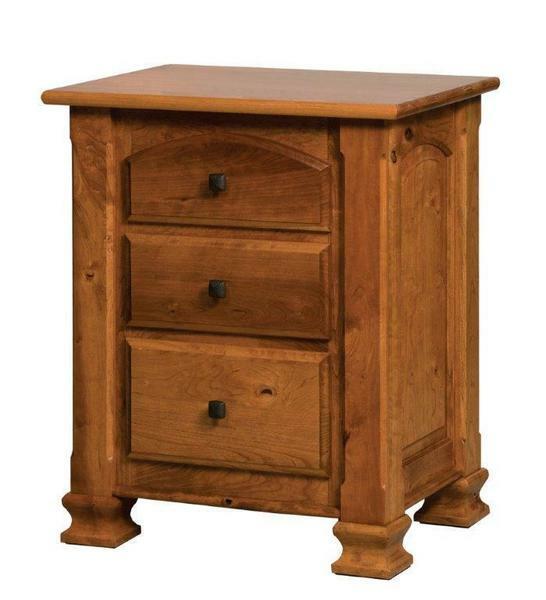 Give your bedroom suite spectacular appeal with the handcrafted Amish Charleston Nighstand with Three Drawers. Amish bedroom furniture is made with care and built to last a lifetime. Why not invest in the very best for your slumber suite? Our wide variety of 100% solid hardwoods will allow you to create the look of your dreams. Choose from options such as oak, brown maple, elm, and sap cherry wood, to name a few. Once you've chosen your wood, you'll be able to select a stain that fits your space. Please give us a call to discuss ordering free stain samples to confirm your selection. No matter what you choose, you can be sure that your made-to-order nightstand will have all the hallmarks of authentic Amish hand-craftsmanship. As the years go by, you'll notice new details that the woodworkers have carefully put into your piece. No stone will be left unturned in the construction of your Amish furniture. This nightstand looks excellent paired with the Amish Charleston Bed for a cohesive and stylish look. We'd love to speak with you about the many possibilities for your Amish Charleston Nightstand. Feel free to get in touch with a friendly Amish furniture specialist by calling 866-272-6773. We look forward to guiding you through building the Amish furniture of your dreams! Dry Brushing finish is a unique painting technique in which most of the paint is wiped off of the brush prior to applying it to the furniture. This technique results in a beautiful finish where the character of the wood grain is able to still be appreciated, as the grain and character of the wood still show through the paint.